As an example, we're showing you Anveo's internal Phone Number verification process using Anveo Call Flow and Anveo API. Anveo's communication platform includes a feature that allows account holders placing web-based calls to change the CallerID that is displayed. Recognizing the potential for mistakes and abuse, Anveo provides an automated phone number verfication process to confirm that CallerID numbers chosen by the customer are in fact owned by the customer. This verification process, explained below, utilizes Anveo IVR Call Flow and Anveo API. 1. Every CallerID phone number has to be confirmed/verified after it is initially entered into the customer's account information. 2. The customer initiates the verification procedure and is presented with a 4 digit verification code on the screen. 3. The customer receives an automated phone call on the phone number to be verified. 4. The customer is prompted to enter a verification code that has been presented on the Anveo web page. 5. If the customer has difficulties entering the code then he/she will be given another confirmation code which can be entered on Anveo.com to complete the verification procedure. 6. The phone number is considered confirmed/verified only when the correct code has been entered either over the phone or from the anveo.com web site. 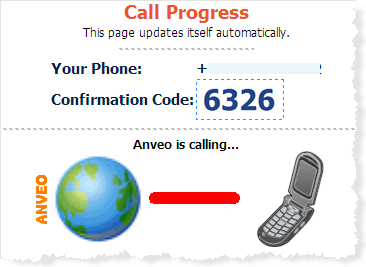 In addition to Phone Verification Call Flow (shown below), Anveo.com has two custom pages (URLs). The first URL processes the status of the verification passed from Call Flow via HTTP. It accepts three parameters in the query string: CUSTOMERID, PHONENUMBER and RESULT. The second URL is used to obtain call progress information. It is called via an AJAX script every 20 seconds or so to provide visual call progress details. When a customer makes a request for a CallerID phone number verification, Anveo generates a verification code which is presented to the user on the screen. Using API, Anveo initiates DIAL.CALLFLOW API Action and passes four IVR CALL FLOW variables: CUSTOMERID, VALIDCODE, PHONENUMBER and MANUALCODE. A visual call progress monitor is implemented using a combination of AJAX technology and Anveo's DIAL.GETSTATUS API request. The customer has four attempts to enter a valid code. If after the fourth attempt, they have not entered the valid code, Anveo plays back a manual confirmation code to be entered on the Anveo.com web page.